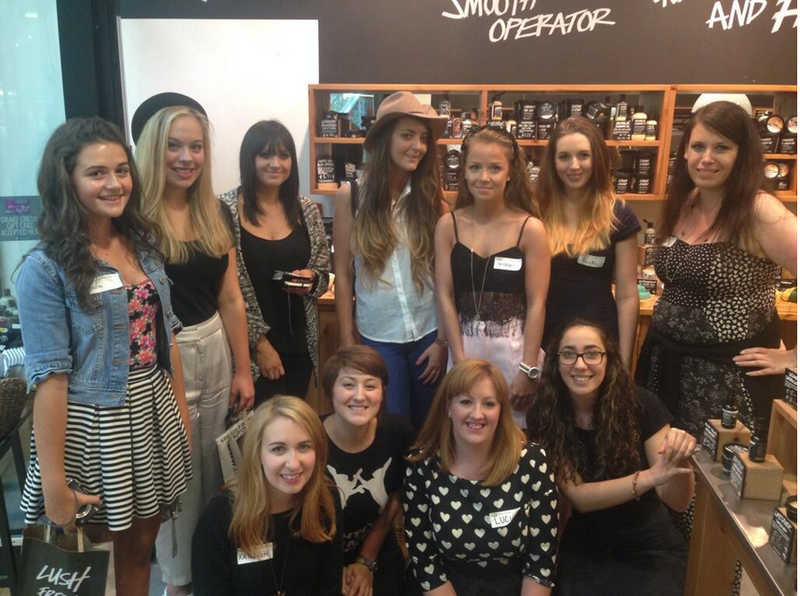 Last Thursday, myself and six other lovely bloggers were invited down to Lush in Drakes Circus, Plymouth for their first ever blogger event. We were greeted by the lovely staff in the beautifully aromatic shop with sweet goodies including mini cakes and veggie Percy Pigs (my favourite)! Adam and the Lush team were going to take us on a one-stop tour of Lush; They talked us through the ethics and background of the company. I really love how Lush buys all of their supplies ethically, fresh and are against animal testing as I always try not to buy anything that goes against these morals. All of their products are handmade by specialised 'Lushies' too which is great! First up we were shown Buffy- a square exfoliator that also adds moisture back into the skin. We looked at the original ingredients for this product which includes cocoa butter, shea butter, ground rice, almonds, lavender oil, lemon oil and ground aduki beans and how they could benefit your skin. I actually suffer terribly with dry, sensitive skin all over my body and face so this exfoliator which also adds back the moisture to the skin instead of stripping all of the body's oils out is fantastic. Of course it has no harsh chemicals in it either, so great for sensitive skin like mine. I volunteered to try out Buffy! We then went on to my favourite part of the night; We all had a chance to make our very own Lush bath bomb! I've always been a fan of Lush's bath bombs and they have become a real treat for me to enjoy in a nice relaxing bath, especially after all of my exams! The bath bomb that we made was called Big Blue. Big Blue is a calming and softening bath bomb with extracts of lavender and lemon oil and also seaweed and sea salt is present. I loved the story that we were told about Fisherman Pete in Poole who collects all of the seaweed from its natural source ready for the products in Lush just like Big Blue. It sounds like Lush are really involved in all parts of the manufacturing process for their products, which is refreshing as it can be rare for businesses to be involved with their suppliers etc nowadays. We mixed the fresh ingredients together and packed them into a special Lush mould where they had to set for 24 hours before using them. It actually surprised me how simple it was to make (although I did have some difficulty trying to get the mould in place perfectly... ok so it may be harder than it looks!) but it surprised me even more when we were told that Lushies in the Lush factories usually produce approximately 10 of these a minute! Now that is talent! Then we went on to see another interesting product. Adam must have been tired after a long day of work and of course organising the fun event so he had a few minutes to sit down and soak his feet for a demonstration of Stepping Stone, a foot scrub filled with pumice and fine sea salt to eliminate any nasty dead skin. You can use Stepping Stone simply as a small bath bomb- like product for your feet or alternatively you can break bits off and rub against your feet as an exfoliator. I think I fell in love with the smell of this product- it was just salty, beachy goodness in a foot shaped mould! Lastly we were introduced to Lush's brand new suncare range. With Summer finally getting started, this range has such a variety of innovative products- one perfect for everybody! I especially liked the Million Dollar Moisturiser which not only moisturised your skin but also had SPF and gorgeous light reflecting pigments to give you a healthy glow. We all had the opportunity to each take home one product from the new skincare range along with Stepping Stone and our own- made Big Blue. I took home the Sesame Suntan Lotion which is a light moisturiser with SPF 10 in it, so perfect for when I'm just out and about everyday to prevent those harmful rays! I will be writing some in-depth reviews on each of the products that I took home from this Lush event very soon, so keep your eyes peeled! 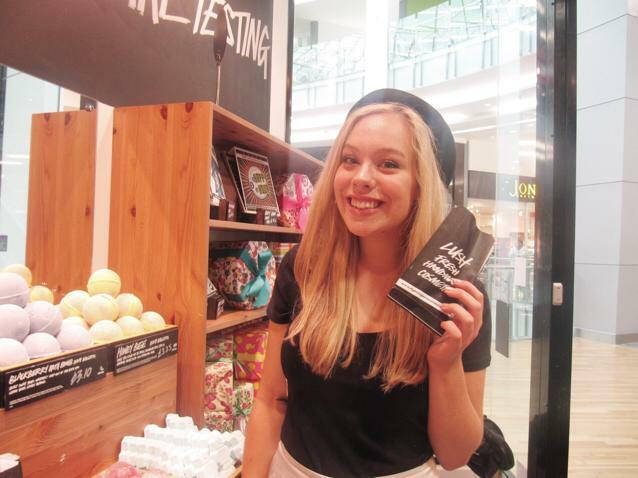 I very much enjoyed this event at Lush; I learnt a lot about the company and I absolutely love what they stand for. What also struck me was how genuinely friendly all of the staff were at Lush. They were all so passionate about the company and they genuinely want to help you find the product which is best for you in the long term, rather than just being desperate to flog you a product which I've noticed in a lot of other shops lately. It was also really nice to meet my fellow Plymouthian bloggers at this event as we rarely have any events aimed at bloggers in this city so I hope this fantastic one hosted by Lush will be the first of many to come! 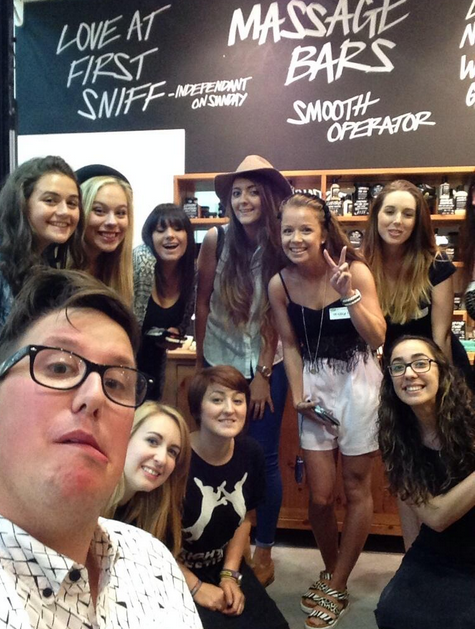 I want to say a big thank you to Adam and the team for hosting the event and I can't wait to visit Lush again soon! You can check out all of the action from this event by searching the hashtag #LushPlymouthBlogs and follow Lush Plymouth @LushPlymouth ! I'm absolutely devastated I missed this after I was invited! Are you based in Plymouth? There aren't many Plymouth bloggers!